Then in the evening a welcome dinner with traditional Scandinavian food is waiting for you and we talk about the days ahead of us. We equip you with boots and additional warm clothing if you need it. 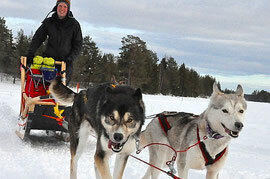 Informative pre-tour introduction and instruction into Dog Sledding with competent, friendly, bilingual instructors. 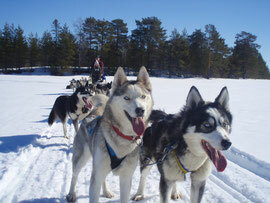 it is time for you to leave..
Then it`s off on our first sleddogtrip, the tour is about 22 km through the surrounding forests. Swedish barbecue hut ( grillkåta ). There we enjoy a typical Souvas of reindeer. After breakfast we feed the dogs together and prepare for the day. 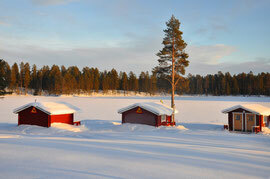 in the silent, white-covered landscape of Lapland. Later in the day we test our skills with ice fishing. We make holes in the ice, and start fishing. then dinner is decided for the evening! Breakfast and feed the dogs. experience the silence and beauty of untouched winter landscapes.